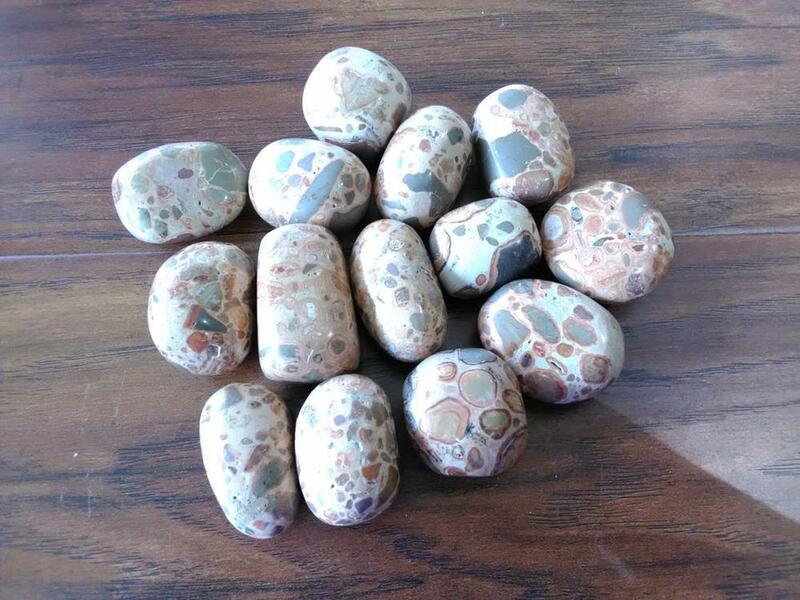 Jasper, Leopardskin/Leopardite (tmbl) Grounding, protective. Patience, responsibility. Circular breathing. Healing on heavy emotional issues. Calms instinctive fears and terrors. Detoxifies. Nutrition. Root, Solar Plexus. Peaceful energy, which assists in letting go of conflict, insecurity, control issues & judgmental attitude. Connects with inner wisdom & our ancestors in spirit world, bringing inspiration & ancient knowledge. Enhances self-respect & self-worth & balances emotions. Helps deal with difficult situations in calm & concentrated way. Clears blocks, old beliefs & clutter from past towards a brighter future. Links with wisdom & knowledge from those teachers who have walked this Earth-path before us. Can be used to reconnect with our ancestors & works on cellular memory, genetics & DNA. Size Range: 1 1/4" - 1 1/2"